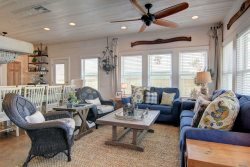 A beachfront vacation home rental in Port Aransas with million dollar views of the ocean. Enjoy New Boardwalk to beach on a Mustang Island in South Texas. A wonderful vacation rental home. Spectacular gulf views make this an incredible Port Aransas vacation home for the entire family or small group. Enjoy a beach vacation with plenty of additional things to do in and around Port Aransas. **NEW Boardwalk to the beach** Access to beach is much easier this season. A 4 bedroom beachfront home in a very nice neighborhood with two pools and a very short walk to the downtown boardwalk area and marina. The beach is three minutes from your front door. The first floor has a queen bedroom and private bath where someone gets to slip away to a quiet and restful place. The second floor or main living level has a large, open-living room, dining and kitchen. There is plenty of room here for a large family gathering and lots of entertaining. A half-bath is also on this level. The second floor level has a large covered deck with ample seating and a million dollar view of the beach and the Gulf of Mexico. Kick back on the front deck with your favorite beverage and a good book and let your worries drift away. This is a great place to watch the sunrise. Another deck off the back of the home allows a spectacular view of the lights of Corpus Christi in the evening or views of the ships as they come through the channel. Great place to watch the sunset! Enjoy cooking in the well-appointed kitchen with all the extras included. Also, on this second level is the first large master bedroom with king-size bed and large en-suite bathroom. From this master there is access to the front deck and the spectacular views and gulf breezes. There is also a utility room with washer and dryer on this level for your personal laundry. As you make your way up to the third level the views get even better. Relax on the chaise lounge in the reading nook as you gaze to the gulf. The third floor deck has ample seating and is not to be missed. There is a large second living area where many a game night can be enjoyed. There is a TV surrounded by 3 sofas and a day bed that is also a trundle. The third floor also boasts a second master bedroom with a queen bed and an en-suite bathroom. The fourth bedroom is a fun, nautical inspired bunk room. There are two sets of bunks with full size beds on the bottom and twins on top. There are weight limits on the bunk beds. This floor also includes another full size bathroom. Guest have access to a large gas grill. MacBeach House can accommodate all your parking needs with 2 separate drive ways and access to a 2 car garage. This is a non-smoking home and no pets are allowed. This home also has Spectrum/Time Warner Cable and Wi- Fi. Our family enjoyed our week in Port A at this house. Property manager was great to work with and very accommodating. Location to the beach, across from boardwalk, was what got our attention. The grandkids loved the family room on the third floor. We would definitely rent again. Family members traveled over 3,000 miles to be together for a week on the beach. The 5 youngest children would see the ocean for the first time. The house was perfect. Property management communicated every detail needed, were prompt, and professional. My family and I thank you for the use of your wonderful home. Note from Guest: This house was the perfect 4th of July get away. We stayed with three other couples. The men have been close friends since high school. This was the first vacation for our families that we have enjoyed together and we couldnt have had a better time! Love the houses proximity to beach and view of fireworks from the balcony.